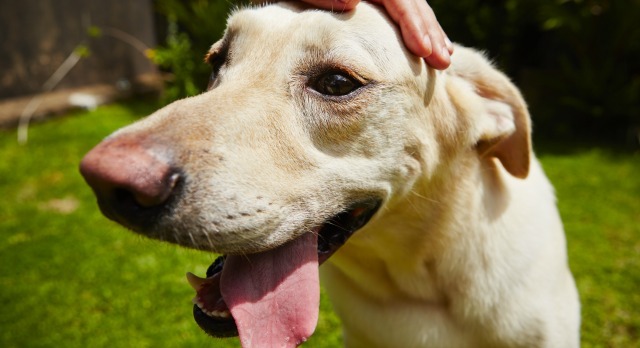 If you notice any signs of heat exhaustion or heat stroke in your pet, take immediate steps to cool the animal and take it to a veterinarian for a physical exam. Did you know that animals that are left outside in the heat for extended periods of time are susceptible to heat exhaustion and heat stroke? Heat exhaustion is the first step toward heat stroke and, if caught early, can easily be alleviated. Heat exhaustion symptoms can include heavy panting; weakness; signs of confusion; dizziness; nausea; a fast heart rate; and dark colored urine, which can indicate dehydration. Heat stroke is much more serious. Symptoms can include rapid panting; a very high temperature (although in severe cases the temperature can fall very low); either a bright red or a very pale tongue and gums; thick, sticky saliva; depression; weakness; dizziness; diarrhea; shock; coma; and, sometimes, sudden complete cardiovascular collapse. With temperatures reaching 100 degrees on hot summer days, it is crucially important to pay attention to the needs of your furry friends. If you notice any of the signs listed above, it is important to take immediate steps to cool your pet, including moving to an air conditioned environment, wetting down your pet’s hair coat, offering your pet cool (not cold) water to drink and taking him to a veterinarian immediately for a physical exam. What can you do to prevent heat exhaustion and heat stroke? l Pets with pre-existing conditions like heart disease or obesity, or geriatric animals, animals with respiratory problems, or any animals with a very thick hair coat should always be kept in the shade and should not be left outside for extended periods of time. l Clean, fresh water should be available to all animals whether inside or outside at all times. If outside, make sure your pet’s water bowl is placed in the shade. l Never muzzle any dog that is going to be left outside. l Avoid walking animals on hot concrete or asphalt where there is not shade. Hot surfaces such as these can cause burns to the paw pads. l If you must be outside during a hot time of day, wet your pet down and provide a child’s swimming pool filled with water to help pets stay cool. l Avoid walks and runs during the hottest parts of the day. Sudden heat stroke during strenuous activity can lead to sudden collapse, and even death. When you do go out on walks, be sure to take water with you to provide a source hydration and internal cooling for your pet. Be sure to take water for yourself as well. l Never leave an animal in a car for any length of time when it is hot outside — even if the car is in the shade and all windows are cracked. Even when it is 80 degrees outside, the inside of a car can easily reach dangerous temperatures quickly. In the city of Lawrence, it is illegal to leave an animal in a car for longer than five minutes if the temperature is 80 degrees or higher or 30 degrees or lower. If you see an animal in distress in a hot car, please take the initiative and call 911. You may save a life.